1) Green the goodies: Think of all the candy wrappers that one little goblin throws in the trash – then multiply that number by the millions of trick-or-treaters who are happily gobbling up their stash. Offer organic apples from the farmers market or buy treats in bulk to minimize packaging waste. 2) Come up with a new costume: Skip the racks of colorful costumes at the mall (most of them are made of non-renewable materials like plastic) and come up with a creative idea for a homemade costume. Add a bandana to a pair of jeans and a denim shirt for an instant cowboy costume or put on your wedding dress and go as the Bride of Frankenstein. Or, host a costume swap with the neighbors. The costumes their kids have outgrown might be the perfect fit for your little one. Here's my family's contribution towards the HallowGreen effort: all three costumes were made from old clothes and toys that were lying around the house. 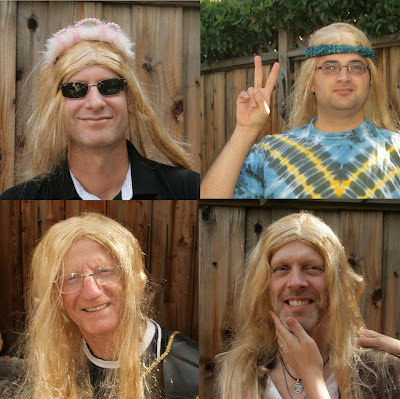 In my family, a single wig goes a long, long way. How's that for reducing and reusing? 3) Choose natural decorations: Bails of straw, colorful mums and a handful of gourds are great seasonal decorations that can be composted on November 1st. If scary witches hanging from the oak tree and plastic pumpkins on the front step are a must-have, scour secondhand stores. The author of these tips, Jodi Helmer, also has a great book that offers eco-friendly lifestyle tips for Halloween and every other day of the year: The Green Year: 365 Small Things You Can Do to Make a Big Difference (from Alpha Books). I'm really enjoying reading through my review copy and I'll be posting a review about it soon. Have a safe, happy and green Halloween! I did not receive a sample in order to review this product, but no monetary compensation. The views and opinions expressed here are my own. Today's review isn't just for Halloween -- you can enjoy Brandi Carlile's album year round -- but with a title like Give Up the Ghost, how could I not feature in on Bonggamom's Halloween Haunts? I was treated to a free download of Brandi Carlile's new album, Give Up the Ghost, which was released on October 6. It became iTunes' #1 bestselling album just days after its release, and even now it's still on iTunes' Top Albums list. I find it so much easier to listen to an album when I like the artist. I don't know too much about her, but what I know about her, I really like! She really sounds like an indie artist, one who cares about making music first and foremost. She sounds folksy and earthy and very real. I also admire the fact that Brandi is using her artistry to make a difference -- she has created The Looking Out Foundation to financially support the causes she cares about. I don't really have anything negative to say about this album -- if you're a fan of acoustic guitar and simple ballads, there's nothing to complain about! 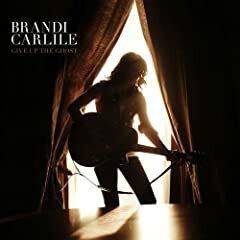 The producers of Give Up the Ghost say, "If you like KT Tunstall, Indigo Girls, Missy Higgins and Rachael Yamagata, then you will LOVE Brandi Carlile". I love KT Tunstall, and I agree! Hello dear readers! 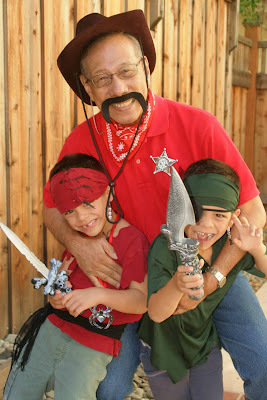 I've just entered J&O Fabrics' Halloween contest for best homemade costume. 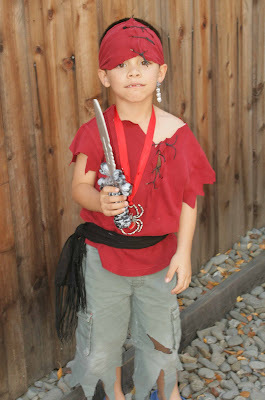 I've entered Jammy's homemade pirate costume because it's authentic looking, cute, and -- most important for the lazy or non crafty folk out there, which is, like, 99% of everyone -- it is SOO easy to make. Please vote for Jammy and send the message that ANYONE can create a great homemade costume! The entry with the most votes by Oct. 31 will win! To vote for Jammy, head on over to the poll at the address above and click on letter L (Pirate). Thanks for your support! Halloween is my favorite holiday, so every October I go all out with Halloween themed decor. I get out the orange-and-black storage bins on the first of the month (I'd do it sooner, but Alfie won't let me), do a little bit each day, and by the time Halloween night rolls around the house is decked from head to foot in spiders, cobwebs, bats, skeletons and pumpkins. PartyLite is a direct seller of home ambience products like candles, candle accessories, home fragrance, accent decor and more. They carry an assortment of seasonal products for Halloween and Autumn, including the Spooky Cat Tealight House, the Ghoulie Aroma Melts Warmer, and the Change-O-Luminary, which I reviewed. 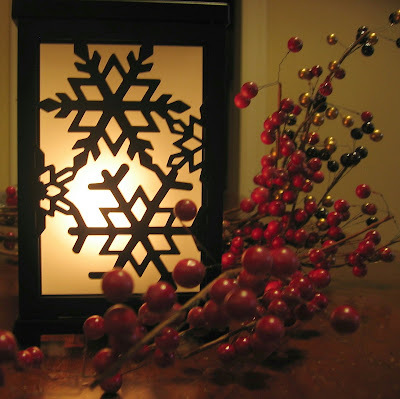 The Change-O-Luminary is a frosted-glass luminary with 3 sets of interchangeable metal panels. Each set of panels has a separate theme -- a spiderweb for Halloween, fall leaves for autumn, and snowflakes for the winter. Do you love decorating for Halloween? Get ready for the oohs and ahhs! The trick to decorating is finding the best ideas. The treat is that PartyLite has them all right here. PartyLite, the world’s largest direct seller of home ambiance products including candles, candle accessories and home ambiance products, takes all the horror out of day with new chilly weather scents, platinum quality candles and fabulous accessories for the season. Goblins everywhere can set a stylishly spooky scene to hand out their holiday tricks and treats! Change O Luminary transform the ordinary to extraordinary with this versatile fall piece. 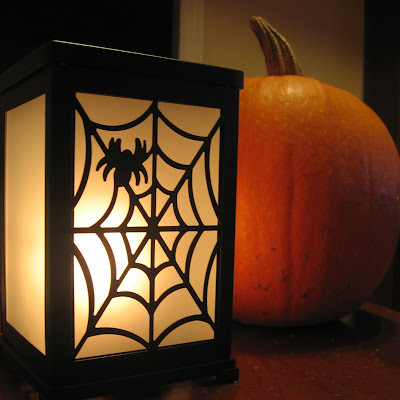 The luminary includes a votive cup six decorative magnetic panels – two spider webs, two snowflakes and two leaves to bring your décor through all the chilly weather seasons. I love, love, LOVE this product! First of all, it's beautiful. The simple, box shape of the luminary and the dark, matte metal frame make it easy to blend into any decor (it goes perfectly in our Craftsman-style home). The frosted glass gives the candlelight a beautiful glow (the Halloween tealights they sent us fit inside perfectly, and they gave off the most wonderful, subtle fragrance), and each of the 3 metal designs sets the spirit of the season without being tacky or over-the-top. I'm caught in the web of the mesmerizing candlelight.... and happy to stay that way. 'Snow place like (a beautifully-decorated) home! I sure could fall for this luminary. Even Alfie, who is extremely picky about home decor, says it's a beautiful, beautiful luminary. It's also really easy to change out the designs, it's cheaper than buying 3 separate luminaries, and takes up waay less space. It's the perfect seasonal decor, for all the seasons! I'm so hooked on the idea of changing panels that I've gotten greedy: In the words of Oliver Twist, I want some more, please! I'd love to be able to purchase extra panels to stick on my Change-O-Luminary. How about a Hannukah menorah? Or an Arts-and-Crafts / Frank Llloyd Wright window outline? The possibilities are endless! 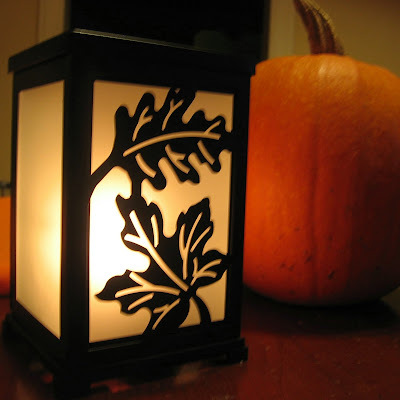 The Change-O-Luminary is an easy, beautiful and practical way to refresh your home decor throughout the year. I received a sample in order to review this product, but no monetary compensation. Unless otherwise, stated, the views and opinions expressed here are my own. Encyclopedia of Haunted Places lists down a number of haunted houses around the world. Most of them are in the US and Canada, but there is a section for haunted places in Europe, Asia, South Africa, Oceania, Mexico, the Caribbean, and South America. Each place is accompanied by a brief description of the place, the haunted history behind it, and a description of some of the paranormal activities that have been observed there. The Encyclopedia of Haunted Places is the first directory to be written by dozens of the world's leading paranormal investigators. Research notes, location background, first-hand accounts, and many anomalous photographs featuring ghostly manifestations comprise the hundreds of haunted listings in this directory. For years, paranormal investigative groups have been studying their local ghosts with scientific equipment as well as with more esoteric methods, such as psychics and sÃ©ances. This directory is a repository of some of their most profound cases. From across the United States, Canada, and many spots around the globe, ghost investigators tell of their sometimes harrowing experiences, share their research, and give readers an overview of both well-known and obscure haunted locales. From private residences to inns and restaurants, battlefields to museums and libraries, graveyards to churches, The Encyclopedia of Haunted Places will offer supernatural tourists a guide to points of interest through the eyes of the ghost hunters. This reference also offers names, addresses, phone numbers, and Web addresses to each location covered. Feeling brave? You may just want to stop and visit some ghosts on your next trip. Despite all the horror flicks out there, there's nothing quite as thrilling or scary as a real ghost story, and this one has dozens. Like any encyclopedia, this isn't meant to be read from cover to cover in one sitting -- I like leafing through the book and reading whatever catches my eye. I especially love the stories told by the ghost hunters (or as they are officially called, paranormal investigators) featured in the book. We also had a fun time looking to see if we had actually been to any of the places listed in the book, or if we were familiar with them (Alfie has been to a couple of them in Australia and in England). Best of all, I was thrilled to see that a couple of places in the Bay Area made it into this book -- the Winchester Mystery House in San Jose and the Oakland Bay Bridge. I've never been to the Winchester Mystery House and I've felt no hurry to visit, because I've always thought it was just a tourist trap. Now that Jeff says the place is really haunted I might actually change my mind. And I don't think I'm ever going to cross the Bay Bridge again without feeling a shiver and a tingle! I'm not sure why the photos in this book are so limited in quantity, quality and size. Most of them are small, underexposed black and white photos. I wondered if perhaps they were taken as proof of paranormal occurrences, but other than a few dots of light, I couldn't see anything out of the ordinary in any of those photos. Large, colored photos of some of the haunted places would have made this book much more appealing to browse through, even if the photos didn't have anything ghostly in them. If you want to send a few shivers down your spine, Encyclopedia of Haunted Places makes for a great Halloween nighttime read! It's also a fun travel guide for anyone looking to visit a haunted house. I received a sample in order to review this product, but no monetary compensation. Unless otherwise stated, the views and opinions expressed here are my own. Here's a fun online Halloween contest that will bring out child's creative side. It's sponsored by Printies, whose craft product Printies Design Studio I'm reviewing (watch out for my review post in the next week or so). Just create a Halloween-themed Printie character, post it to their online gallery, and you get a chance to win one of 31 Printies Design Studios! Click here for more details and complete contest rules. Hurry, the contest ends November 1! I did not receive a sample or monetary compensation for this post. Unless otherwise stated, the views and opinions expressed here are my own. One of the things on my to-do list is to visit the Disneyland Resort during Halloween. Not only is every inch of Disneyland and Disney's California adventure decked out with pumpkins, even the attractions get a Halloween theme. and the fireworks show has Jack Skellington making a star appearance. Speaking of stars, even Space Mountain gets a Halloween costume -- it becomes the Space Mountain Ghost Galaxy, with ghosts coming out of the dark and reaching out to people on the ride. And of course, there's Mickey's Trick or Treat Party, the ultimate Disney Halloween event. It sounds like a fantastic experience, and I hope I get the chance to take the kids in the future. If you live in the Bay Area, xiaolinmama has a perfectly spooktacular giveaway going on -- she's giving away a free trip to Disneyland for a family of four! Click here for the full deets and to enter. All entries must be received by November 30, 2009. Winners will be announced on or around December 14th. No purchase necessary. Open to legal residences of 50 United States and D.C. ages 6-14 as of November 30th 2009. Void where prohibited. I did not receive or monetary compensation for this post. The views and opinions expressed here are my own. Yo Gabba Gabba! is a groundbreaking television series that infuses retro style and modern-day music to teach simple life lessons. A vibrant cast of puppet characters and special guests play and dance when they hear the magic words 'Yo Gabba Gabba!'. Today's most popular names in movies, television, music and sports flock to guest star in the groundbreaking show, including Jack Black, Rachel Dratch, Tony Hawk, Biz Markie, MGMT, Mark Mothersbaugh, Andy Samberg, Amy Sedaris, The Shins, Amare Stoudemire, Jimmy Eat World and Elijah Wood, among others. This is the first time fans of the show will be able to purchase the amazing original music featured on the show as well as exclusive original music performed by guest bands like The Roots, The Ting Tings and more. For more information and to purchase tickets, visit the Yo Gabba Gabba Live! website, or go to www.ticketmaster.com. We're not watching the live show, but if the cd is anything to go by, the funky techno-beat is going to whip those young concert-goers into a frenzy of song and dance. It's got all the songs from the tv show that kids know and love. My kids' favorites are Get the Sillies Out, I Like to Dance, and of course, Party in My Tummy. Yo Gabba Gabba reminds me of the Teletubbies: the characters are simple, cheerful and so childlike they almost border on the psychedelic. You either love 'em, hate 'em or wonder what the heck these creatures are doing. But hey, what do I know, I'm just a parent. The kids aren't doing all this analysis. They just like to sing and dance with the characters. If your child is a Yo Gabba Gabba! fan, he or she will love the Music is Awesome! cd. One lucky Bonggamom Finds reader will win a copy of the Yo Gabba! Gabba! cd, Music is Awesome! To enter this giveaway, simply leave a comment here and tell me your favorite Yo Gabba! Gabba! character. Don't forget to leave an email address or some other way of contacting you. Maximum of 4 entries per person. US mailing addresses only. This giveaway ends at midnight PST on November 6, 2009.; I will draw a winner at random on November 7 and post the winner's name on the comments section soon after. For additional giveaway rules, click here. Good luck! Green is a staple Halloween color -- think of green pumpkin leaves, green slime and green monsters -- but it never really occurred to me that Halloween isn't a very green holiday. Green, as in, good for the environment. With all the plastic skeletons and fake spiderwebs and candy wrappers floating around this time of year, all this trick or treating can actually have quite a negative impact on the environment. (I'm guilty of buying lots of plastic decorations as well, but I do keep the decorations and use them year after year. Needless to say, my Halloween decor collection is turning into its own monster). You can find more tips like this for Halloween and every other day of the year in Jodi's book, The Green Year: 365 Small Things You Can Do to Make a Big Difference (from Alpha Books). I'll be receiving a review copy soon, and I can't wait to read all of her tips for making small changes to our lifestyle. The Jungle Grapevine is a children's picture book set in the heart of Africa, where we find jungle animals engaged in an afternoon of speculation, rumor-spreading and generally freaking each other out. Here's what the publishers have to say about the book: In The Jungle Grapevine (Abrams, Sept. 2009), acclaimed artist and debut author Alex Beard reinterprets his memories of the African savanna's most colorful inhabitants to create a modern retelling of the classic game of telephone. Beard also created a companion set of board games, card games and puzzles featuring the most endearing characters of The Jungle Grapevine. It's all part of his mission to demystify art, making it available to people in all ages and stages of life. We really enjoyed reading The Jungle Grapevine! The story is funny and entertaining and sparked a lot of discussion about misunderstanding and overreacting. And I can't say enough about the illustrations. There's just so much to look at, my kids spent ages just leafing through the pages. The book is really high-quality, with a beautiful typeface (I can't believe I'm actually raving about a font!) and nice thick paper, and it certainly wouldn't look out of place on the shelf next to our classics like Winnie the Pooh and Alice in Wonderland. The accompanying Jungle Grapevine puzzles and games are just as beautiful. The 3D elephant puzzle we received was the perfect complement to the book. When it arrived in the mail, I gave it a cursory glance and dismissed it as one of those cheapy balsa-wood puzzles that you can buy at your local dollar store. But upon closer inspection, it's actually a high-quality toy that's challenging to put together and beautiful enough to display. Unlike the cheapy unpainted versions, the pieces in this puzzle have been painted so the finished product looks just like the elephant in the Jungle Grapevine book. 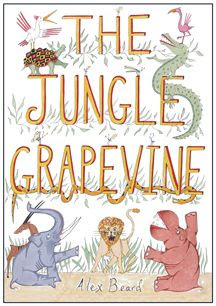 The illustrations in The Jungle Grapevine are so whimsical and charming, I think any parent would love to decorate their child's nursery or bedroom in a Jungle Bedroom theme. Unfortunately his Jungle Grapevine prints are way too expensive for the average Joe, and I'd love more affordable decor options besides the oversized Alphabet Flashcards. How about some Jungle Grapevine bedsheets or tshirts? The Jungle Grapevine makes a beautiful, educational present for any child. If you're feeling generous, throw in one of the companion games or puzzles for even more jungle fun. The whole series will give children a renewed appreciation of art! Do NOT enter this Sweepstakes. Because I want to win it. 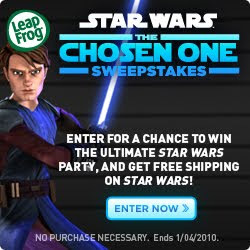 Leapfrog has an awesome Star Wars sweepstakes going on for the next several months. They're giving a total of seven first prize winners will receive a Tag, Leapster2 or Didj system and a Star Wars game or book. That would be a great sweepstakes in itself, but Leapfrog has gone All Out and come up with a Grand Prize worth over $3000! It's a Star Wars party for your child and ten friends. The prize package includes 11 Leapfrogs, Tags or Didj's, 11 child Star Wars costumes, a party package, an R2D2 trashcan, and other fun things from that Galaxy Far, Far Away. And the best part of this prize is a $200 gift certificate to Merry Maids, so you don't even have to clean up all that party mess! You can enter once per day until 1/4/2010. But you're not going to enter, are you? Please? Wow! Wow! Wubbzy! is Nick Jr.'s #2-rated preschool property, with its popular tv series, online games and podcasts. Even the youngest viewers can relate to the situations that Wubbzy and the gang find themselves in, and each show reinforces important preschool social skills like sharing, getting along and helping others. Wubb Idol is Wubbzy's first TV movie and highest-rated Wubbzy episode of 2009; it has just been released on DVD on October 13, along with new Wubb Idol-themed books from Scholastic and Wubb Idol toys from Fisher-Price. In “Wubb Idol” (SRP $16.98), Wubbzy, his best friends, Walden, Widget and Daizy, can’t wait for the most popular girl group, The Wubb Girlz, to pay a visit to host the “Wuzzleburg Idol” talent show! Everyone in town hopes to win the contest. If Wubbzy can wow the judges, he’ll get the chance to go on to Wuzzlewood and perform with Sparkle, Shimmer, and Shine at their big concert and maybe even become a movie star! But will he remember the importance of just being himself? Viewers join “Wubb-Z,” Walden, Widget and Daizy and special guest stars Beyoncé and former ET anchor Jann Carl – on the coolest, star-powered road trip ever filled with singing, dancing, best friends and more! Multi-award-winning international pop sensation Beyoncé Knowles makes her voiceover debut in “Wubb Idol” – her first-ever children’s project – as Shine, the lead singer of the most awesome girl group, The Wubb Girlz! The new 93-minute DVD – with double the content of the “Wubb Idol” TV movie – also features special activities, coloring pages, music videos and more! What can I say except Wow! Wubbzy is the sweetest little character, with a heart of gold and a body to match. He's so cute, you can't help but wub, I mean love, him! Beyonce's cartoon character, Shine, looks almost as hot as Beyonce herself. She sparkles, shimmers and shines like the star she is. Her Sing A Song, is my favorite track on the Wow! Wow! Wubbzy! Sing a Song cd. It's bright and catchy and it reminds me of Beyonce's "Single Ladies". Not that I'm trashing any of the other songs in the album, which contain songs on the Wubbzy tv show that kids know and love. I don't think the show had to be as long as it was. Kids don't need feature-length entertainment to enjoy, and keeping the show shorter would help parents limit their kids' tv time. I would have preferred several, shorter episodes so we could extend the Wubb Idol fun over several sessions. The new Wubb Idol DVD is going to Wow! Wow! Wow! your preschooler with a fun , danceable music, and a great take-home lesson: Be happy with who you are. * the new Wow! Wow! Wubbzy! Sing-A-Song CD featuring the original song composed and performed by Ms. Knowles! To enter this giveaway, simply leave a comment here and tell me your favorite Wow! Wow! Wubzy character (I like the kid who says, "Wowwww.....kooooooooky!"). Don't forget to leave an email address or some other way of contacting you. 3) Blog about this giveaway and include a link to the giveaway post (leave a comment here with a link to your post). Maximum of 5 entries per person. US mailing addresses only. This giveaway ends at midnight PST on October 31, 2009.; I will draw a winner at random on November 1 and post the winner's name on the comments section soon after. For additional giveaway rules, click here. Good luck! Disney on Ice: Princess Classics features the stories of: Jasmine, Ariel, Mulan, Sleeping Beauty, Belle, Snow White and Cinderella. With each story, skaters perform ice routines set to music from the Disney movie. Here's what the producer, Feld Entertainment, has to say about the show: Disney on Ice presents Princess Classics is an amazing journey to the magical land of Disney classic fairy tales. Travel to a kingdom under the sea, an enchanted French castle, an Arabian palace and more! With special guest Tinker Bell, enter the worlds of your favorite Disney princesses Cinderella, Jasmine, Ariel, Sleeping Beauty, Belle, Mulan and Snow White and see their dreams come true as this royal skating extravaganza brings magic to your hometown! We came in with high expectations, and the show met every one of them. The quality of the show took Alfie's parents' breath away! The skating was great, and so were the costumes and special effects. The grownups' (Alfie, Alfiesmum and Alfiesdad and my) unanimous favorite was the glow-in-the-dark Little Mermaid production number. And I can't overstate how much my kids enjoyed the show. The Pea, at the sophisticated old age of 8, considers herself too old for Disney princesses, but she got really involved-- as did her brothers -- in the storylines, the skating and the singing. I kept sneaking peeks at them and seeing them singing along to the music. Truth be told, I couldn't help singing too. And I loved the way the whole audience was so engaged: when Snow White's wicked stepmother, disguised as an old crone, offered Snow White the poisoned apple, my kids joined everyone else in the arena shouting NOOOOOOOO! 1) I wish the evening show had started a bit earlier than 7:30PM. Since the show is 2 hours long, the kids stayed up way past their bedtime and woke up the next day tired and cranky. 2) After we had arrived home and decided to take out our old Princess Classics souvenir programme to see what had changed in the six years between shows. The answer: NOTHING. As in, the two programmes were IDENTICAL. The photos, the text, even the message from the producers. The only difference was the cast. Now, don't get me wrong: I have no problem whatsoever with Disney on Ice running exactly the same show. After all, shows on Broadway run for years and years, and you don't go around changing the script, do you? Our enjoyment of the 2009 performance was not diminished in any way by the fact that we had watched the exact same show 6 years ago. But I felt quite betrayed by the fact that the photos I was seeing in the 2009 souvenir programme were not only not the photos of the 2009 performing cast, but were actually 6 years old. And come to think of it, how do I know that these photos were photos of the 2003 cast? For all I know, those photos could be 10 years old! Come on, guys, people shell out a lot of money for the stuff you sell in your shows, so don't cheap out! You can always count on Disney on Ice to deliver a high-quality show that parents and kids will enjoy. Their Princess Classics show is the perfect way to give your little princess a night to remember! Use the coupon code MOM in the MC Promotions box on www.ticketmaster.com to get four tickets for $44 (Mon-Fri matinee shows) or $4 off Friday night and weekend shows. Click here for a complete list of show venues, dates and times. Enjoy the show! I received complimentary event tickets to the event, but no monetary compensation to review the show. The views and opinions expressed here are my own. Today was a wet, wet day; after months of dry, hot weather, a storm hit the Bay Area and it was like the floodgates had opened (I probably shouldn't joke about floods given that half of Metro Manila was under water just a couple of weeks ago). It was a sobering reminder that there's more where that came from, and the cold and flu season is on its way. Just a couple of days ago, I received an invitation from Boiron, a manufacturer of homeopathic products, to discuss the things I do to keep my family healthy during the cold and flu season. I thought it was intriguing that their goal was not to review their product, rather to get a discussion going, so I decided to participate. Besides, I'll take any opportunity to chime in with my opinions. 1) Get a flu shot -- Funny that this should be number 1 on my list given that we missed both flu clinics that our doctors' office set up. But we fully intend to get our shots this year. Even though there's a lot of discussion about whether flu shots actually work, whether all this immunization is good for kids, and even all the controversy about the link between thimerosal in vaccines and autism, I firmly believe that the flu vaccine works. It's just empirical: one year, I don't get a shot and I get the flu. The next year, I get the shot and don't get the flu. Same with Alfie. Same with my aunt. Hmmmmm.....coincidence? I think not. 2) Wash hands -- Pretty simple, huh? Kid with cold wipes snotty nose with grimy hands, then holds doorknob. Five minutes later, my kid holds the same doorknob. Voila, flu city. Had my kid washed his hands, the snotty germs would have been washed away. I'm pretty bad about remembering to ask my kids to wash their hands, but I'm getting better. Anyway, lately they've been coming home with such grimy hands that it's impossible not to ask them to scrub that dirt off. 3) Stay warm and dry-- I know this is sort of an old wives' tale. You don't catch a cold just because you're cold, you catch it because you've been infected with a cold virus. But I think being out in the cold and damp weather weakens your immune system, making it easier to catch cold. If my kids do catch a cold or the flu, I usually just let it run its course and avoid too much medication, unless the kid is really uncomfortable, in which case I give ibuprofen for fever and a menthol cough drop for a sore throat. I don't find that cough or cold medicines do much to help, but I make an exception at nighttime. I think that getting a good night's rest is a priority, especially when they're sick. Coughing or sneezing keeps my kids awake at a time when it's crucial for them to sleep, so I'm happy to help them sleep with Benadryl or a nighttime cough or cold mixture. Homeopathic medicines? I've never tried them, and I admit I don't really understand what homeopathy is. According to Boiron, Homeopathic medicines work to stimulate the body's own healing processes and they use natural substances in micro-doses, which sounds quite intriguing and really beneficial. But Boiron's FAQ page didn't really answer the question, and the Wikipedia entry was equally confusing. All that dilution and dosing. Boiron's going to be sending me some samples of their homeopathic remedies for kids, and hopefully it's going to come with some kind of explanation. I'll let y'all know how it goes. Near East makes boxed grain dishes like couscous, pilaf, tabouleh, and other grain dishes that incorporate flavors and cuisines from around the world. Their new Pearled Couscous is made with pasta pearls that are larger than traditional couscous. Here's what Near East has to say about their product: New Near East Pearled Couscous brings the elegance of Mediterranean cuisine straight to the kitchen. Near East Pearled Couscous, made with all-natural ingredients and Certified Kosher, is ideal for consumers looking for a flavorful and versatile side dish. It adds elegance to any meal in just 20 minutes. I'm a gal who likes to decide what we're going to have for dinner an hour in advance, then throw everything together -- so there's nothing like the convenience of Near East couscous. It's so easy -- just boil and add spices. Even better, the Gourmet Meal Kit allows me to have a fancy-tasting Middle Eastern meal on a whim. I don't usually have these kinds of spices readily available. I'd have to decide I wanted to prepare a Middle Eastern dish days in advance, get a recipe, shop for ingredients, hope everything turns out well, etc.... so the Gourmet Meal Kit really works for me. I was a bit surprised by the gummy texture of the pearls, but I have no complaints about the taste whatsoever. We've tried it plain, as a side dish, and I'm dying to try the Sicilian Caponata and Couscous salad by Near East chef Michael Psilaskis (go to NearEast.com for the recipe). Stay tuned for the results! 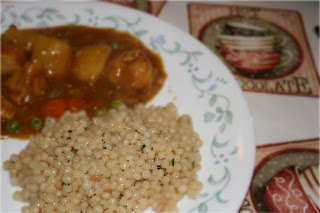 Pearled couscous can take some getting used to if you don't have an adventurous palate. Half of my family liked it, the other half didn't (interestingly, the 3 girls -- me, The Pea, and Alfie's mum -- liked it, and the 4 guys -- 3Po, Jammy, Alfie, and Alfie's dad -- didn't). Everyone liked the taste, but the boys weren't too fond of the pearls. I guess the pearled texture isn't for everyone. New East Pearled Couscous and Pearled Couscous Gourmet Meal Kits are a great way to add some sophistication and global flavor to your meals, without much work! At Home With Friends represents the Grammy Award-winning violinist's life-long dream of recording an album of instrumental and vocal duets with an amazing roster of musicians and friends and includes collaborations with Regina Spektor, Josh Groban, Sting, Kristin Chenoweth, Chris Botti, and more! The album covers all of the genres, from classical to pop, bluegrass to Broadway, jazz and ethnic World Music. There are even a couple of seasonal tracks in there, just in time to celebrate the holidays. I love this album! Fans of Joshua Bell and the other artists will enjoy being a part of one of his musical gatherings. I'm not a celebrity stalker, but the idea of Joshua Bell jamming with other talented artists is just too irresistible. And the music is great; I love that it's such an eclectic collection of pieces, with something for every taste. My favorite tracks are Left Hand Song with Regina Spekter on vocals, and the unique, amazing duet with sitar player Anoushka Shankar. Oh, and Come Again with Sting. I can never resist an album with Sting on it -- the man is a musical god. The big selling point of this cd is the idea of getting a peek into the musical gatherings that Joshua Bell holds with his artist friends, so I'd have loved to hear more about it -- maybe more photos of Joshua Bell's home performance area, quotes or interviews from the artists he collaborated with, stories of why they chose a particular piece. Okay, maybe I'm a bit of a celebrity stalker. Just a bit. 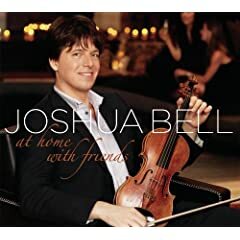 If you're a Joshua Bell fan and you close your eyes while listening to this cd, you might actually be able to pretend that you're in one of his eclectic musical gatherings. Even if you're not a fan, it's a great collection of easy listening tunes, and I'd recommend it for your own gatherings. I think this is a great idea: you know you need those labels anyway, so why not do something worthwhile while you're buying them? October is Breast Cancer Awareness Month (thank goodness there's lots of pink stuff on Bonggamom Finds!) and every dollar donated to raise awareness or search for a cure helps. They sell everything online from electronics to Halloween costumes, so if you're stocking up on anything from home decor to holiday items, that coupon is gonna come in handy. I did not receive a product sample or monetary compensation to review this site or for this post. The views and opinions expressed here are my own. It has been 4 years since we last had a good family portrait session, and I've been meaning to schedule one before the kids grow up even more and become completely unrecognizeable. Picking a portrait photographer isn't an easy task. I'm done with the unnatural "tilt your head this way and place your hand on his shoulder" style of Sears and The Picture People, but I didn't want half-closed eyes or anything too wacky. Several weeks ago, Erin of ErinLeigh Photography offered to show us a new kind of family portrait -- one that can be casual, spontaneous, real, but still stylish and beautiful and maybe even a little bit Bongga -- and we couldn't be happier with the results. 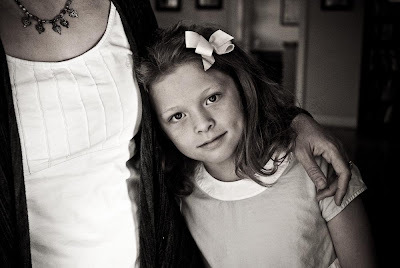 Erinleigh Photography specializes in children and family portraits. Erin will travel to your home or to a location that you find especially picturesque or meaningful, like a local park, a neighborhood square, or your home. 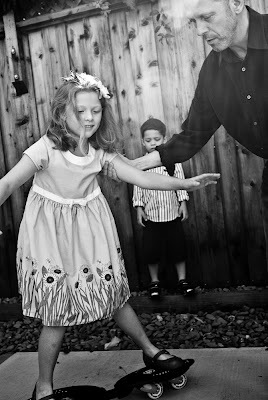 She mixes traditional images with candid, informal shots with a dash of her own relaxed, natural style. No stiff posing or cheesy grins here. As Erin puts it herself, "Family pictures doesn't have to equal Olan Mills anymore ... Messy hair is okay. Perhaps even the occasional peanut butter sandwich crumb. It's just real life". 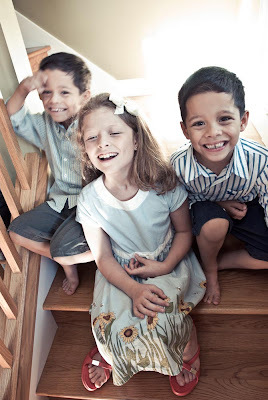 ErinLeigh Photography specializes in environmental, documentary portraiture for families, babies and children. Erin will travel to your home or other locations around the San Francisco Bay Area that you find especially picturesque or meaningful (like a park, a favorite beach, street corner, etc...). Her style is relaxed, real and definitely not run-of-the-mill. As Erin herself says, "Family pictures doesn't have to equal Olan Mills anymore ... Messy hair is okay. Perhaps even the occasional peanut butter sandwich crumb. It's just real life". I was so happy with the results of our photo session! I love my family and I think we look terrific, but I didn't think we looked that terrific. She made everyone's messy hair look cute, and somehow managed to do away with my wrinkles, zits and belly fat. Hmmmm.... maybe we need to be submitting some headshots to model agencies? Then again, maybe not -- Erin would have to be in charge of each and every photo shoot. 1) I LOVED how Erin incorporated our home into the shots: almost every photo features something that we love about our house, like the front porch, the back porch, the staircase, and the driveway. We've put a lot of time, money, effort and love into making our home a special place for our family, and Erin immediately recognized that. 2) Check out Erin's portfolio, and you'll see that her photos run the gamut from black and white to full, vibrant color -- so I have no clue how she could predict that I would love the grainy texture and vintage tone of our photographs. Maybe she just knew that this is what would work best with what we were wearing, with the colors of our home, whatever. Or maybe she just flipped a coin. I don't care -- the result looks great. 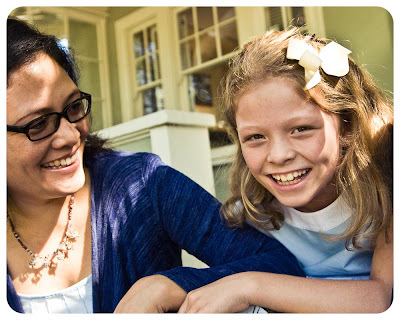 3) Erin worked really well with kids, Also, she's very approachable and easy to work with. She's no artistic diva; she definitely takes your preferences into account. 4) Her rates are reasonable compared with other great photographers in the Bay Area. I'm a fan of Martha Bruce and Anna Mayer , and I have to say that Erin's work is right up there with theirs -- but thank goodness for our budget, her rates are more affordable. Affordable rates were on my list of Bongga things about ErinLeigh Photography, but I realize that "affordable" is a relative term. I would budget a minimum of $500 for a session, $250 for the session fee plus the cost of whatever prints and digital images you purchase (I'd say $250 covers a basic mix of prints and digital images -- but believe me, you're going to want to purchase way more than a basic mix!). Her rates are definitely higher than strip mall studios but the unique quality of her photos just proves that you get what you pay for, and then some. Judging by the number of results that show up when you Google "ErinLeigh Photography", it's like anyone with that name is destined to become a professional photographer. So make sure you type in the URL above to get the right (and most talented) one! 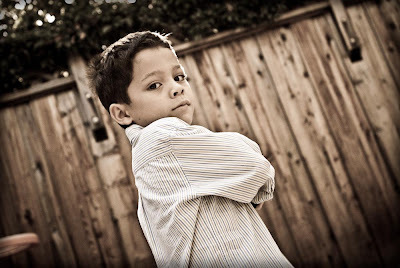 ErinLeigh Photography offers in the San Francisco Bay Area at a fraction of the price of other portrait photographers. Book her now before her calendar fills up! Our session fee was waived and we received a discount on orders, but no monetary compensation. The views and opinions expressed here are my own. 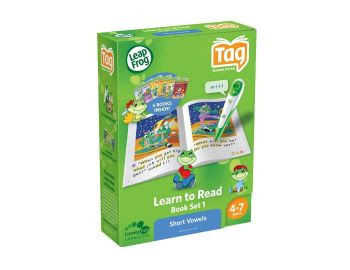 The Tag Learn to Read Phonics helps beginning readers set out on their own by letting kids use the Tag to help them identify words and letter sounds. Series 1 is all about the short vowels. Series 2 tackles the long vowels, silent E and Y. 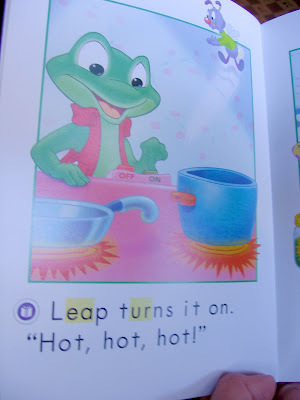 Here's what Leapfrog has to say about the Learn to Read phonics books: Use your Tag™ Reader to make phonics skills spring to life! The Tag Learn to Read Series combines fun stories with rich audio to help children identify letter sounds and hear how they come together to form words. Each six-book set introduces a different series of skills, helping children build confidence with the fundamentals of reading. I think this is what the Tag was born to do. It allows 3Po and Jammy to practice without me hovering over them, so they get a nice mix of learning with mom and dad, and learning on their own. The books have just the right mix of easy and challenging words for my sons' reading level (as in, they've figured out how to sound words out, they can already sight read some simple words and they can sound out almost all the rest). They have moved beyond the BOB books but aren't quite ready for beginning reader books, and this series gives them the confidence to read on their own. Note on the video that 3Po only uses the Tag if he's unsure (and kids seem to know when they're reading the word wrong), he doesn't use it for every single word. I think kids really do want to read on their own -- but the great thing about the Tag is that it is there to help them out if they get stuck. I could not for the life of me figure out what the yellow-highlighted words or letters (such as "ea" in the word "Leap" in the photo below) were on these Tag books! There was no explanation on the box nor on any of the books. It took me ages to understand that the yellow-highlighted words are words that the Tag does not break up phonetically; if you point the Tag on them, it will read out the word or letter blend in its entirety (such as "ur" in "turns" in the photo below). A parent guide with explanations and tips would have helped! The Tag Learn to Read phonics series combine good old-fashioned sounding words out with the coolness of the Tag to help kids learn to read. Last week I had the time of my life visiting Santa's Workshop. Okay, I lied. 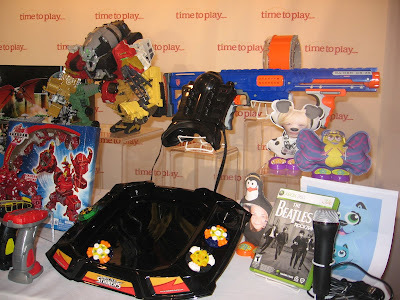 But I did get the next best thing: the opportunity to visit New York and attend Time to Play Magazine's annual Holiday Showcase. Time to Play's chief Toy Guy, Chris Byrne, must have apprenticed with Santa himself, because he and Time to Play head Jim Silver have come up with the 2009 Most Wanted List of toys for the holiday season. The highlight of the event was the press conference where Jim and Chris did a roll call of the 16 toys that made the list, and told everyone why they thought these toys were so great. You can see their list here, or keep reading below to see all 16 toys and my initial take on them. Be sure to check these toys out; they're sure to sell out soon! Center: Eyeclops Night Vision Goggles. 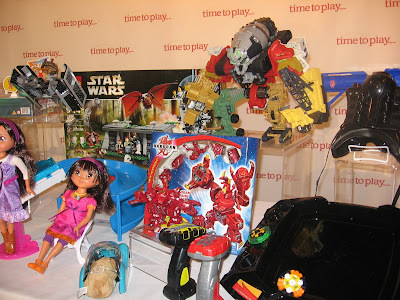 Clockwise, from left: Bakugan 7-in-1 Maxus Helios, Transformers Constructicon Devastator, Nerf N-Strike Raider Rapid Fire CD-35 Blaster, Printies, The Beatles Rock Band, Battle Strikers. 1) Eyeclops Night Vision Goggles: Utter coolness for young spies-to-be allows them to see in the dark (as in, monsters-in-the-closet dark, boogeymen-in-the-basement dark) up to fifty feet. 2) Bakugan 7-in-1 Maxus Helios: This will probably be on 3Po and Jammy's Most Wanted List. It's 7 Bakugans that all work separately (place each little ball on a magnetic card and they pop open to become little dragon/robot figures) as well as connect to form a huge Bakugan Beast. 3) Transformers Constructicon Devastator: This is another 3Po/ Jammy favorite, although at age 5.5, they're still not too adept at transforming the Transformer toys they already have. 4) Nerf N-Strike Raider Rapid Fire CD-35 Blaster: Hmmm. I'm not a gun fan, so Santa won't be showing up with one of these anytime soon. 5) Printies: Print and stuff your own stuffed toy -- without pricking your finger on a single needle! When I saw this, I immediately began making plans to feature this as a craft activity at The Pea's next birthday party. 6) The Beatles Rock Band: I like the concept of introducing the Beatles to a new generation, but since the only video game consoles we have in our household are the Leapfrog Leapster and Didj, I can't really form an opinion on this video game anytime soon. 7) Battle Strikers: A spinning tops game, with a twist -- you can actually control your spinning top via a magnetic finger glove, and use it to spin your opponent's top out of the battle arena. Looks like great fun, but I'd need some practice to get my top spinning for longer than 5 seconds. 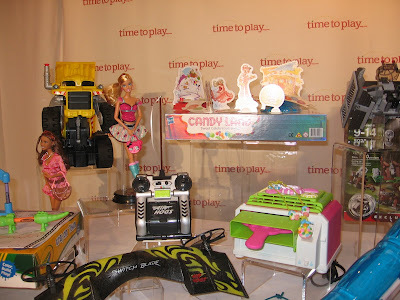 Clockwise, from left: Barbie Fashionistas, Rocky the Robot Truck, Candy Land Sweet Celebration, Girl Gourmet Sweets Candy Jewelry Factory, Air Hogs Switchblade. 8) Barbie Fashionistas: Barbie does street glam with pop-fashion outfits. Barbie was my #1 toy when I was a little girl, but sadly enough, The Pea seems to have moved on from Barbie. Maybe these dolls will bring her back. 9) Rocky the Robot Truck: A moving, grooving truck with a personality, this is something that would definitely have been on my boys' Most Wanted lists three years ago. 10) Candy Land Sweet Celebration: It's an updated Candyland that, unlike other "updated" versions, actually improves upon the original! Now you can set your own path -- great for parents who want to slit their throats because the game goes on forever. 11) Lego Star Wars: Everybody's favorite building toys meets everybody's favorite sci-fi movie. What's not to love? Well, maybe the fact that the Legos always break off and get lost once 3Po and Jammy build them (with considerable adult help at this point), but give it a few years and I'm sure we'll be up to our ears in Lego x-wing fighters and AT-AT's. 12) Girl Gourmet Sweets Candy Jewelry Factory: The product is sweet, sweet, sweet, and girls will love using it. But the apparatus is bulky, bulky, bulky, and parents might hate storing it. 13) Air Hogs Switchblade: A flying remote-control toy that can hover like a UFO and fly like a plane. I didn't get a really close look at this one, but I'll bet that Alfie, I mean 3Po and Jammy, would love to get their hands on it. Clockwise, from left: Dora's Explorer Girls, Star Wars Lego, Transformers Constructicon Devastator, Eyeclops Night Vision Goggles, Battle Strikers, Bakugan 7-in-1 Maxus Helios, Zhu Zhu Pets. 14) Dora's Explorer Girls: I have mixed feelings about the idea of the new, tweenie Dora; I think she looks much better than the old, big-headed Dora, but I'm concerned about the over-sexualization of preschool cartoon characters. I know the introduction of New Dora is supposed to make little girls grow up with Dora, not out of Dora -- but I wonder whether the older girls will continue to shun Dora in either form while the 3-year olds simply abandon Old Dora for New. 15) Zhu Zhu Pets: I'm not surprised this made the list; these cute, chattering hamsters have already found their way into my kids' hearts, and I hear they're already sold out at Target and Walmart. Clockwise, from left: Crayola Crayon Town, Rocky the Robot Truck, Barbie Fashionistas, Candy Land Sweet Celebration, Lego Star Wars, Girl Gourmet Sweets Candy Jewelry Factory, Air Hogs Switchblade. 16) Crayola Crayon Town: A cute, inexpensive craft activity that lets kids use crayons to color in the town background and set, then stick the crayons onto plastic pieces to make play figures for pretend play on the town. 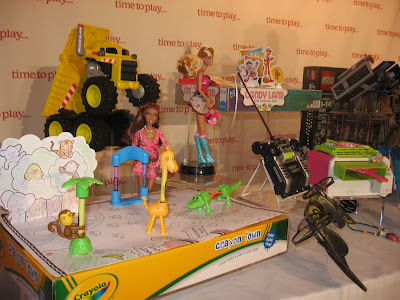 I'll be reviewing some of these toys in the near future, so watch out for more detailed descriptions and opinions! 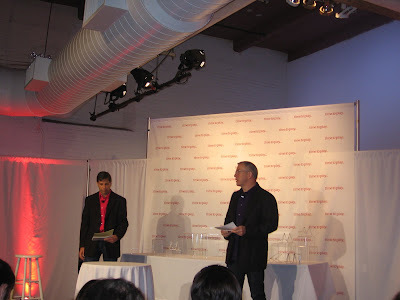 I received product samples but no monetary compensation in conjunction with this event and post. The views and opinions expressed here are my own.